Everybody get our tissues--because you're going to need them. Ok, good. Don't say I didn't warn you. Four years ago, former sportscaster and current, beloved longtime Good Morning America anchor Roberts received a life-saving bone marrow transplant to a rare blood disorder, and every year since then, she celebrates that day as her birthday. Roberts credits her resilience to her mother whose mantra "everybody's got something" helped her get through her difficult journey. Now, to celebrate this "fourth birthday," Roberts has launched a new podcast called Everybody's Got Something, which will highlight stories of redemption and recovery through the most difficult times. “It’s all about honest and important conversations with everyday heroes and celebrities … and some laughter too,” Roberts said. Each episode features candid, in-depth conversations with guests who open up about their obstacles and journeys to self-discovery. In the first episode, Food Network superstar Giada De Laurentiis opened up about her unbearable grief following her brother's death. "I think I shut down for quite some time, several years," she told Roberts. "And it wasn't really until I had my daughter that I realized, 'Okay, I think I can love like this again.'" 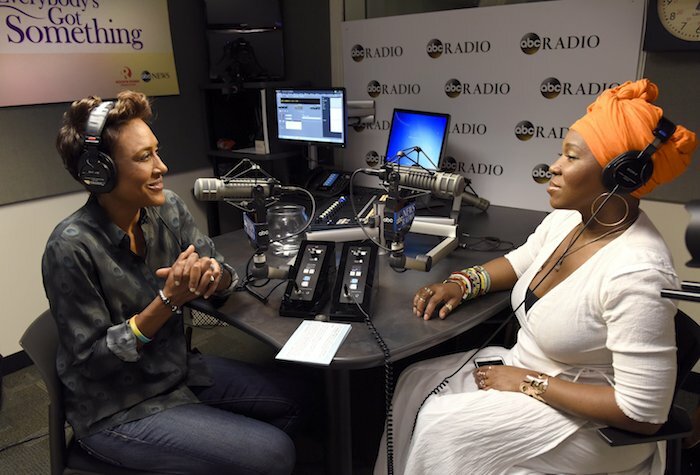 In the third episode, Roberts sits down with longtime friend India Arie who discusses her loss of self-confidence. “I was broken. I knew no one was going to be able to put me back together but me...and I didn’t want to die....and I felt like I was in danger of dying,” Arie said in the interview. For more stories of strength and self-discovery, be sure and check out Robin's podcast here.